Among the founding principles of The D’Onofrio Firm, one that clearly stands out is our ongoing commitment to the communities where we live and practice. The D’Onofrio Firm is committed to supporting and improving our community and society at large through our work. The D’Onofrio Firm is proud to support the organizations making a difference in our communities including: Temple University School of Law, Girls on the Run of Montgomery and Delaware Counties, YMCA, Philabundance, American Cancer Society and the American Heart Association. The D’Onofrio Firm is passionate about promoting the importance of a healthy lifestyle, and the importance of protecting our food supply by supporting local and family organic farms. 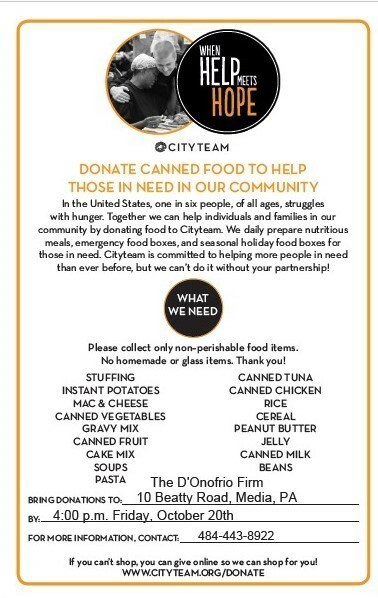 The D’Onofrio Firm is hosting a food drive to support CityTeam Chester. Please bring your non-perishable food items to our office between the hours of 10 am and 4 pm, Monday through Friday. A donation bin will be in our lobby. All donations should be dropped off before 4:00 p.m. on Friday, October 20, 2017.